Subjects, styles, advertising, other relevant information: A number of photographs by Harry Cotton can be found in the Norris Museum, St Ives. The photographer himself is shown in PH/S.IVE/CornEx/16, which is an image taken during a talk at the Corn Exchange by Bob Jude. Harry Cotton is included in the image standing on a table in the foreground, taking a photograph of the event. Several photographs by Harry Cotton depict the products of St Ives woodworking firm Tom M Scotney Ltd, these appear to be from the 1950s and have rubber stamped on the reverse “Photographed by Harry Cotton, St Ives, Huntingdon” e,g, PH/S.IVE/Scotney/3. PH/S.IVE/people 44 is a photo by Harry Cotton from 1934 of St Ives Scouts. A dated 1942 example is a photo of a St Ives Home Guard Team, PH/S.Ive/People 16. Although this has yet to be researched, it is believed that Harry Cotton was a regular contributor of photographs to the Hunts Post. He certainly published photographs in the Cambridge Independent Press. For example, CIP 24 March 1939 p12 has one of his photographs of a winning darts team. References: See above items in the Norris Museum Collection. Address: Westgate Studio, Peterborough, 56 Westgate (1898, 1901, 1906, 1910) 62 Westgate Peterborough in 1911 and 1914. 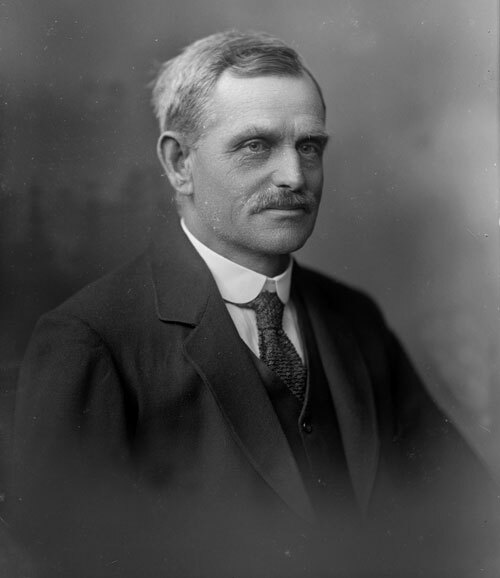 Samuel Busby Cox was born in Spalding Lincolnshire and was the son of another Samuel Cox, a boot maker. In 1881 he was not yet married and was lodging in West Street, Bourne, Lincolnshire, where his occupation was a photographer. In 1891 Samuel was reported to be a widower and was lodging in Randall Street Maidstone, Kent and was again employed as a photographer. In 1901 he was resident at 56 Westgate Peterborough with another wife, Clara Agnes Cox b:1869 Gravesend. He was shown as a photographer working on his own account from home. The 1911 census showed him in similar circumstances but the address was 62 Westgate Peterborough. See below for two cabinet photographs by S Busby Cox (author's collection).The reverse sides of both are blank. 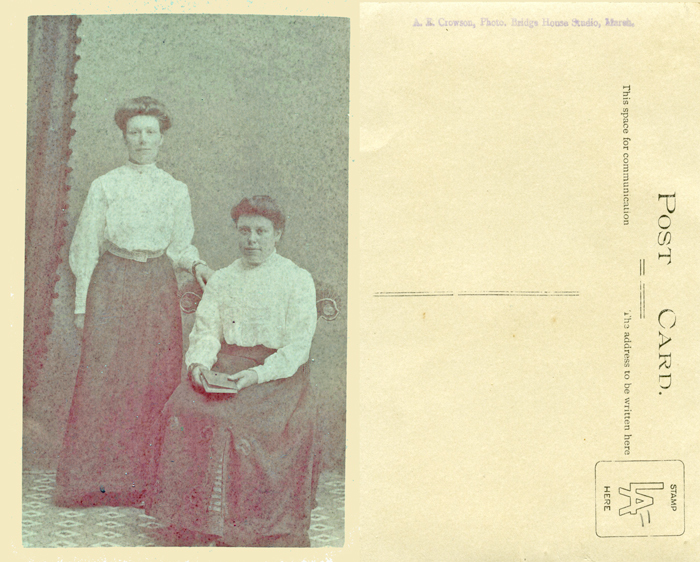 The photograph on the left appears the older of the two, having a less complex mount on cream card with silver printing which includes a monogram of intertwined "SBC" - see below the similarity with another mount dated 1898. 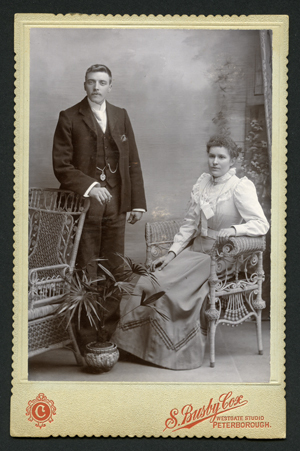 The second, of a young couple posed in a studio with two ornate chairs and a potted plant is mounted on grey card with a distinctive serrated edge. Beneath this photograph is a "C" in a scroll and the text "S.Busby Cox Westgate Studio Peterborough." 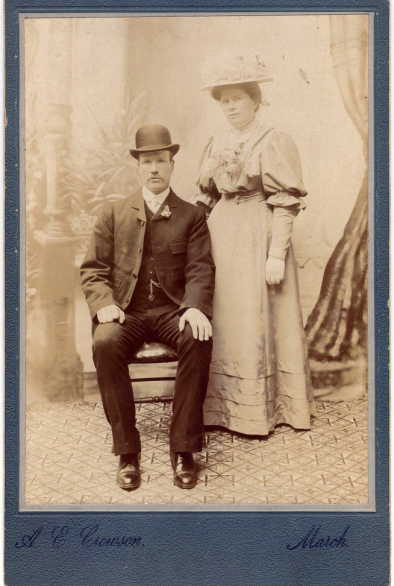 A previous owner of this photograph has added "Uncle George and Aunt Hannah" in pencil. The author has other similar photographs on buff and light green serrated edged cards printed in red and green respectively. 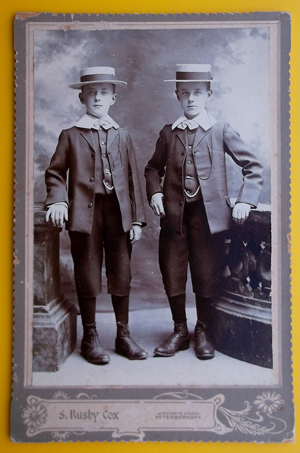 Next is another cabinet photograph of two beautifully and identically dressed twin boys, with an art nouveau daisy design on the face of another serrated mount, this time in grey, the text reading simply "S Busby Cox Peterborough". The reverse of the mount is blank. The style of the mount suggests mid to late 1890s. (Simon Shirley Collection). 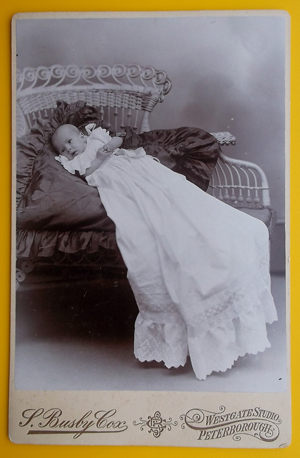 Below this is a cabinet portrait of a baby in christening robes on a large cushion on a cane chair (Simon Shirley Collection). The face of the cream mount is printed in gold "S.Busby Cox Westgate Studio Peterborough", with a monogram with intertwined letters SBC. 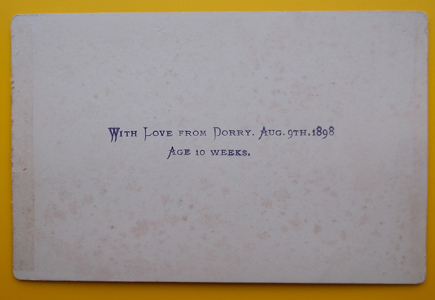 The studio has personalised the reverse of the otherwise blank mount by printing the greeting "With love from Dorry August 9th 1898, age 10 weeks"
Finally, as proof that Cox also worked outside the studio, there is a very rare 6 x 4 inch print of a 19th century thatched shop. This is from the Simon Shirley collection and Simon has identified the location as Eastrea beside the A605 road. The local directory showed the shopkeeper to be John Wilson, who was listed between 1888 and 1904 as a baker. He was succeeded by Elizabeth Wilson, butcher and baker in 1908. John stands to the left at the bakehouse door and the window is full of packets and bottles, so they must have had a grocers shop as well. 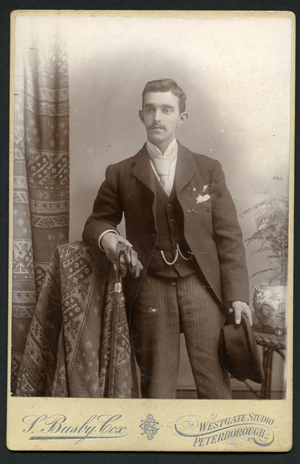 The photo was mounted on a buff card mount printed with the name "S Busby Cox, Westgate Studio". Subjects, styles, advertising, other relevant information: In the 1881 census Thomas Cox was listed as a photographer living at the above address. He was living with his wife Emily Sophia Cox b:1851 Pimlico and sons Percy Thomas Cox b:1876, Cambridge, Alfred Cox b:1877 Cambridge and Harold William Cox b:1879 Cambridge. Ten years earlier in 1871, Thomas was a clerk to the local gas company, living with his widowed mother, Jane Frances Cox , who ran a grocery and earthenware shop at 28 Norfolk Street, Cambridge. When he married Emily Sophia in 1875 Thomas was a woollen draper's clerk. By 1888 Thomas was living at Pratts Buildings, Bradmore Street Cambridge and working as a clerk in the office of Mr Arthur Rutter, the Secretary of the Cambridge Town and University Fire Office. In October 1888 he forged the signatures of his employer and two Directors of the Company, G. Whitmore and SL Younger. He was indicterd for this and appeared in the Cambridgeshire Assizes in November, pleaded guilty and was imprisoned for nine months with hard labour. The judge took the view that although the total sum involved was £7 10sh, the offence involved a breach of trust. In 1891 Emily Cox and the three boys, plus two younger sons Hubert R and Claude S Cox, were living at 14 Fair Street Cambridge - Emily was shown as a dressmaker, married, but Thomas wasn't present. Thomas Cox, then described as a commission agent, was again locked up as a prisoner in HM Prison, Devizes, Wiltshire. He was convicted of obtaining money by false pretences at Devizes assizes on 13 Feb 1891 and sentenced to 6 months imprisonment. In 1901 it appears that Thomas, with sons Claude and Hubert, had moved to Lancashire. They were living at 36 Chestnut Grove, Wavertree, Lancs and Thomas was a tailor's clerk. At the marriage of his son Alfred on 11 August 1900 Thomas described himself as an "accountant". Thomas Cox's photographic career commenced no earlier than 1875, and probably ran until no later than 1888. Emily Sophia Cox was Emily Sophia Nichols before she married Thomas Cox in 1875. She was the youngest sister of Cambridge photographer Arthur Nichols. In 1881 Emily and Arthur's parents, John and Sophia Nichols, both born in Norwich in 1812, were living at 1 Herbert Street with Thomas Cox and his family, two households with a single address. Thomas's second son, Alfred Cox, was born on 24th April 1877 at 1 Post Office Terrace, Cambridge. Post Office Terrace was the location of the Studio of Arthur Nichols from 1865 to 1877 when he left for the Isle of Wight. In view of the family connections it seems likely that Thomas Cox was an employee of Arthur Nichols, perhaps between 1875 and 1877, then possibly even as a short term occupier of the Post Office Terrace Studio between Nichols and Bliss. Bliss traded on the goodwill of his predecessor, citing "Late Arthur Nichols" on his advertising, so if Thomas Cox did run the Post Office Terrace Studio after 1877 he probably did so in Arthur Nichols' name rather than his own. References: Cambridge Independent Press 9 Nov 1888 p8, 23 Nov 1888 p5. England census 1871, 1881, 1891, 1901. Grateful thanks to Mary Shotley for information about the Hynam family which includes Thomas Cox and Arthur Nichols. Subjects, styles, advertising, other relevant information: William Cox appears as a photographer in one local trade directory in Chatteris in 1879. In 1879 William was involved in two problems with the law. In August that year he was involved in a dispute with a local veterinary surgeon, John Gregory Cooper. Cooper and Cox were acquaintances and Cox had done some work for Cooper - a portrait of his wife. It appears that Cox had been ill and, although various customers, including Cooper, owed him money, he had a cash flow problem. He entered into a transaction with Cooper which involved Cooper finding a third party who would lend Cox a sovereign against the security of a bolt of woolen cloth. Cox got the sovereign and Cooper took the cloth, Cox believed to give to the third party. Later, when his fortunes improved, Cox went back to redeem the pledge and he alleged that after some prevarication it became clear that there was no third party and Cooper had kept the cloth and would not return it. Cooper had, in fact, had a suit made from it. Cooper argued that he had kept the cloth because Cox had not paid to redeem it. The local Magistrates seemed to favour Cooper rather than believing Cox, and dismissed the case. During the evidence it became clear that William Cox was also a portrait painter. Later in 1879 William Cox was involved in a dispute about parking his cart, with Mr Joseph Wilkins, late pastor of the Chatteris Zion Chapel. The Magistrates, after hearing the witnesses on both sides, said they were of opinion that Cox had committed a very aggravated, brutal, and murderous assault on Wilkins. He was fined £5, or committed to prison for two months. He was also bound over in a bond of £20 to keep the peace for three months. By a strange co-incidence, Joseph Wilkins was the father of Jeffrey Wilkins, another Chatteris photographer. Is it possible that there was some ongoing animosity between the two families springing from this business competition? There is no trace of William Cox in the 1881 census for Park Street Chatteris, nor is a good match to be found elsewhere. There was a William Cox, an artist and photographer, in Bridge Street Northampton who sold his business and stock in trade in June 1877 after some 20 years of operation there. (Northampton Mercury 16 June 1877). The details from the 1871 census of that William Cox were: b:1827 Northants, wife Mary A Cox b:1834 Northants, sons Arthur CS Cox b:1856 Huntingdonshire and Frederick W b:1858 Northamptonshire. Also living with the family in 1871 were a William Freeman, a learner, and a 17 year old servant, Martha Dicks. Apart from the name, occupation and timing nothing has yet been found to link the William Cox from Northampton with this Chatteris photographer. See below for a rather poor reproduction of a carte de visite from Cambridgeshire Collection ’s Carte de Visite Collection c.65.5 by Charles D CREEK, of an unknown lady in hat and coat (reproduced with thanks to the Cambridgeshire Collection). In 1891 Charles D Creek was living at 14 Union Road Cambridge, staying at the home of his uncle, Henry Thomas Bridges and aunt, Eliza Fordham Bridges (Eliza was the sister of Charles' mother, Lydia). His uncle was a baker and Charles was a baker's assistant. This is the same Charles David James Creek who, in 1901, was at 8 George Street Cambridge, a baker and grocer, living there with his wife Ellen Elizabeth and their 2 year old son Wilfred. In 1911 Charles David James Creek was a baker, working on his own account from home at 7 and 8 George IV Street, Cambridge, with his wife and four children. This is in fact the same address as in 1901. 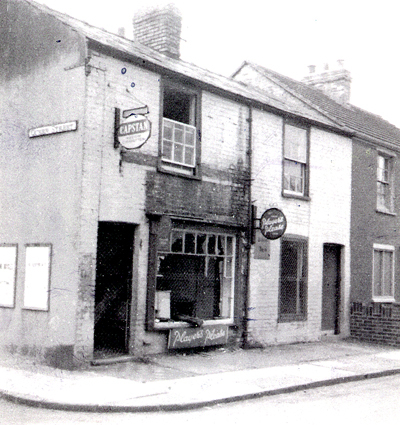 The photograph below is from the 1960s showing the last remains, before demolition, of Charles Creek's shop in George IV Street Cambridge at the junction with Queen Street. The portrait below of Charles was taken by his competitors at Post Office Terrace Studio in Cambridge around 1920, probably by CE Goodrich. It is negative no PCB610/15 and is reproduced with the consent of the Cambridgeshire Collection. Charles died in 1945 after being hit by an Eastern Counties bus in Victoria Road Cambridge. At the time of his death he was living at 5 Chesterton Hall Crescent, Cambridge. What tempted Charles away from the bakery into photography at some point in his early life? When staying and working with his uncle in Union Road, he was living a few doors away from the home of Alfred William Farren, a printseller and framemaker and the son of famous Cambridge photographer, William Farren; could Farren have inspired or assisted Charles in his artistic aspirations? Grateful thanks to Tony Creek for sharing information on his family history and permission to use the photograph of his grandfather's shop. Tony, tonycreek49@gmail.com, would appreciate any further information on this photographer or his work. Subjects, styles, advertising, other relevant information: Angus WC Crisp was the brother of Reginald SC Crisp (listed below), and son of George Crisp, who was described in 1891 as an artist and sculptor. 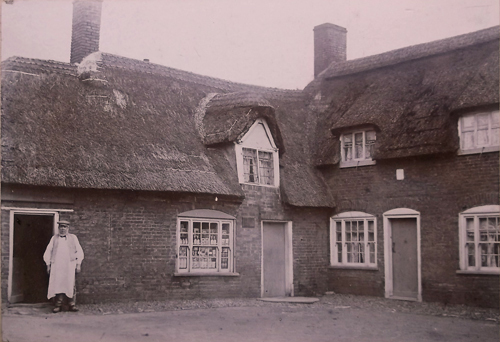 In 1891 Angus Crisp was living with his brother George H C Crisp b: 1862 Sudbury Suffolk, a bookseller, in Bentink Terrace, Cambridge, where he was listed as employed as a "carved oak manufacturer". In 1901, Angus Crisp was living at 30 Union Road, Cambridge with his wife Florence and 2 daughters, Dorothy Violet b: 1899 and Sybil Rosetta b:1901 and a 16 year old servant girl. Angus Crisp was then a self employed fine art dealer. In the 1911 census Angus is listed as a fancy salesman, an employer, operating from the family home at 16 Kings Parade, Cambridge. Angus was then living with his daughters, Dorothy and Sybil. Spaldings directories list him as a photographer at this address from 1912-1940. Spaldings Directory of Cambridge 1912-1940. Subjects, styles, advertising, other relevant information: Bertram was the son od Peterborough wine merchant Ed Crisp, In the 1911 census he appears in the census as a 15 year old schoolboy at his parents house 31 Lincoln Rd, Peterborough. The Peterborough Advertiser p2 10th August 1912 has two photographs credited to B.Crisp, son of Mr Ed Crisp of Peterborough. One is a portrait of famous surgeon Sir St Claire Thomson, taken at the Kings School prize day in Peterborough, the other a group photo of the cast of a theatrical production at the Kings School. Was Bertram just a schoolboy taking some snapshots, or was this the start of a photographic career? Subjects, styles, advertising, other relevant information: Reginald SC Crisp was the brother of Angus WC Crisp above. In 1891 Reginald was living at 31 Union Road Cambridge with his father George Crisp b:1829 Cambridge, described as an artist and sculptor, his mother Frances Crisp b:1834 Huntingdon, sister Charlotte b: 1874 Bury St Edmunds and brother Edward b:1877 Bury St Edmunds. No occupation was shown for Reginald. In 1901 Reginald Crisp was living with his parents George and Frances Crisp, brother Edward and sister Charlotte, at 31 Union Road Cambridge, next door to his brother Angus. Reginald was shown in 1901 to be a grocer's assistant. In the 1911 census Reginald S C Crisp is shown as a press photographer, still living at 31 Union Road, Cambridge, at this point living with his brother George. H C Crisp b:1862 Sudbury Suffolk, a dealer in second hand books and topographical views and his sister Charlotte. Subjects, styles, advertising, other relevant information: Edwin is listed in the 1939 Register as an unemployed photo artist. He was living at the above address with Mary E Croston b:1878 and Gertrude E Croston b:1869. Address: 1 High Street, March, Cambridgeshire. Subjects, styles, advertising, other relevant information: Arthur Ernest Crowson was the son of John Crowson b: 1841 Werrington, sawyer and Sarah Crowson b: 1835 Leverington Cambs. In 1881 the family home was at 12 Chapel Street, Peterborough. In 1891 the family home was at 23 Chapel Street; John Crowson was an agent for herbal medicines, and Arthur, aged 19, was a painter. In 1896 Arthur married Alice Dyson b: 1874 Newborough Peterborough. The !898 Kelly's Directory of Northamptonshire listed Arthur as an insurance agent in North Gladstone Street, Peterborough. In 1901 the family were at 14 Buckle Street, Peterborough. Arthur was an agent for the Prudential Insurance Co. They had two children; William Leslie Dyson Crowson b: 1897 Peterborough and Dorothy Violet Crowson b:1900. The 1904 Kelly's Directory of Cambridgeshire lists Arthur as a teacher of music, living with his family at Nene Parade March. The 1911 census lists Arthur as a music seller and photographer, working on own account at Bridge House, High Street, March. His wife Alice assisted in the business. There was an additional child Cyril Haydn Crowson b: 1904 March Cambridgeshire. In the 1939 Register Arthur was at 1 High Street, March, shown as "Relieving Officer and Registrar of Births and Deaths - retired". Arthur was at the same address when he died in 1945. Below is a cabinet photograph of Bob and Ruth Lambert, c.1910, with the photographer's name and town on the mount below the image. The reverse of the mount is blank. Beneath this is a real photo postcard portrait of two unknown ladies, probably from around 1905-10. 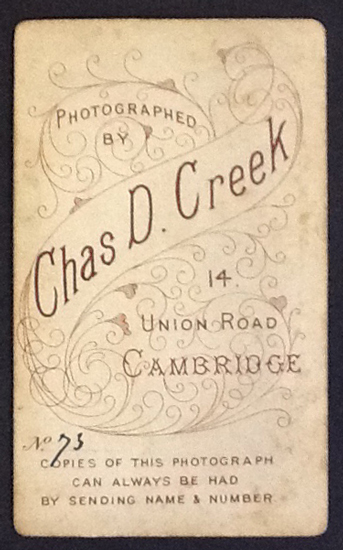 On the reverse is printed "A.E.Crowson, Photo, Bridge House Studio, March". References: We are most grateful to Nick Smith for bringing Arthur Ernest Crowson to our notice. 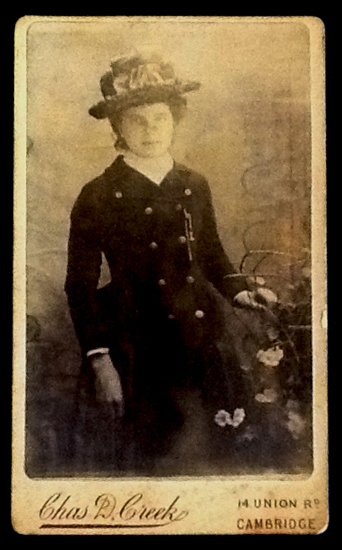 Also to Nick Ramsey, for permission to use the photograph below, part of his collection associated with the Burgess / Halder family tree at www.ancestry.co.uk. References: England Census 1911. Mins Cambridge and District Photographic Society 16 Oct 1923.